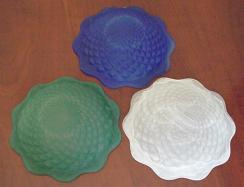 Lotus Style, Floral Shaped Splash Guard - Repair a broken fountain or make your own with this replacement part. I love the lotus splash guard, it enhanced my misting fountain. It gave the fountain a more exotic look. Thanks. Works as promised. I broke the original one that came with the mister and have been looking for months to find a replacement. Most website want to sell you the entire mister not the parts. Thank you for the quick shipment too. Received the items last week and was very satisfied with them. We are now able to enjoy the fountain which we have place in our gazebo. We spend time both a lot of time in the gazebo and the misty fountain is very enjoyable to watch. Do you have any idea when the Lotus Splash guards will be in? As of today, availability is uncertain. Sorry. 0 of 2 Customer(s) found this Answer helpful. Secure Your Work Without Using Clamps. A Large, Three Compartment Vase That Hangs On Windows & Mirrors.